Stitch Dots Needle Nannies are flat and are perfect for holding your needle. They are 1" in diameter so they are the perfect size to put in a corner of your fabric while you stitch. 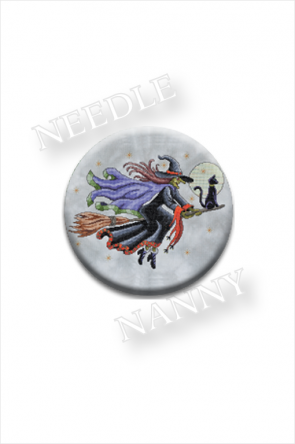 A Needle Nanny, also called a Needle Minder is an accessory that uses two very strong Rare Earth Magnets. The back magnet is removable which allows you to attach the magnet to many items. It's intended purpose is to hold your needle for you when you're not stitching or quilting. Simply place your fabric between the two magnets and you've got the perfect resting spot for your needle.